South China Sea: Who Occupies What in the Spratlys? A closer look at a basic yet poorly understood question. The discourse on the South China Sea disputes is understandably laden with emotion. That is arguably a reason why debate on the subject should be based on facts. And yet, as Bill Hayton has noted, “Unreliable evidence is clouding the international discourse on the South China Sea disputes.” Indeed, it sometimes feels like a thick veil is hiding the truth about the South China Sea. Consider, for instance, the argument that China, far from being the aggressor in the South China Sea, is in fact merely reacting to unilateral provocations by others such as Vietnam. That conclusion is based on some rather questionable evidence, including the suggestion that Vietnam has “doubled its holdings” in the South China Sea in the past 20 years. Even if one assumes that Vietnam occupied 24 features in 1996 (the actual data from which the map often drawn for this line of argument actually specifies 22), the idea that there has been some sort of doubling is misleading. The source for this claim – a 2015 congressional testimony by a senior U.S. defense official – in fact specified 48 outposts amongst the features occupied by Vietnam in the Spratly Islands, rather than 48 features. Using a 20-year timeline is also equally misleading because it leaves out China’s seizure of Mischief Reed 21 years ago. 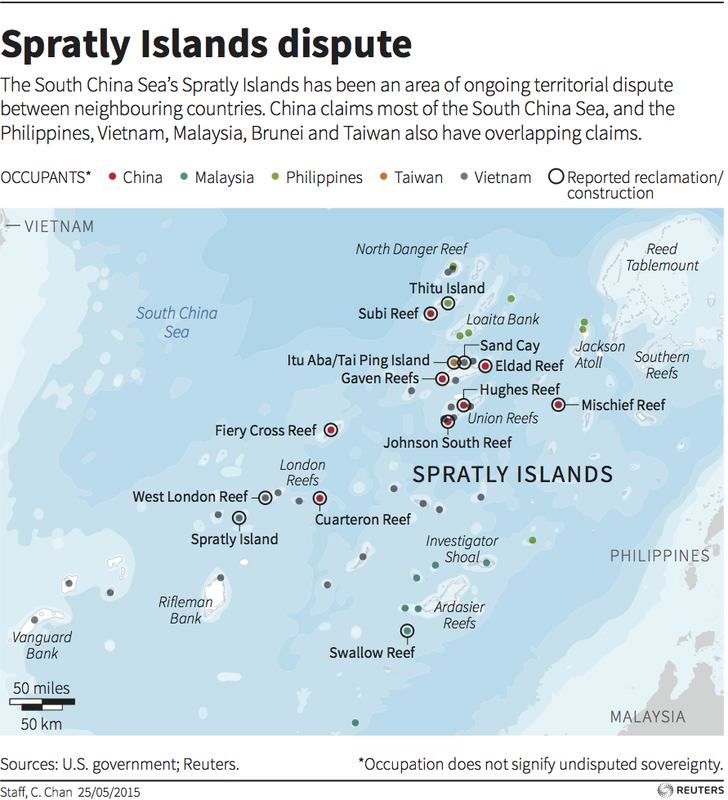 But more broadly, the issue is that there is still no real clarity about who occupies what in the Spratly Islands. It is not uncommon to find articles – and sometimes even publicly available documents, maps and data – that contain inaccurate, conflicting and sometimes unreliable information. This piece attempts to address that issue by looking at who actually occupies what in the Spratlys. In investigating these questions, I have consulted multiple sources, many of which are primary, and interviewed several people knowledgeable about the subject matters. The information obtained has also been carefully checked. In a map (hereafter: APMSS map) attached to its 2015 Asia-Pacific Maritime Security Strategy, the U.S. Department of Defense (DoD) identified 34 outposts on these 21 features. An “outpost” may be as large as an island and as small as a watchtower. East Reef, for example, is counted three times because the feature has not been developed into a single artificial island but remains marked at three locations by four octagonal pillboxes, each of which covers a few hundred square meters. Vietnam also has a similar counting system, but it identifies only 33 outposts (diem dong quan or diem dao in Vietnamese). Why the discrepancy? The extra outpost counted by DoD is a lighthouse on Tennent Reef. Vietnam does not view it as an outpost because no troops are stationed there – it is operated by a civilian company that belongs to the Transportation Ministry. It is unclear when this lighthouse was built, but all the other 33 Vietnamese outposts were established prior to 1989. The APMSS map also indicates that Vietnam has 14 more outposts in the Spratly Islands. Comparing the map with what exists on the ground – or, if you prefer, the water – we can see that they are the 14 lookout structures (nha gian in Vietnamese) that Vietnam is operating on six underwater banks located southwest of the Spratly Islands. Vietnam started to set up permanent structures on Vanguard Bank (Vietnamese: Bai Tu Chinh), Rifleman Bank (Bai Vung May), and Prince of Wales Bank (Bai Phuc Tan) in 1989, on Prince Consort Bank (Bai Phuc Nguyen) in 1990, and on Grainger Bank (Bai Que Duong) and Alexandra Bank (Bai Huyen Tran) in 1991. These platforms measure between 100 and 250 square meters each, and stand on shallow elevations lying between seven and 25 meters below the sea surface. Whether these shoals form part of the Spratly Islands is a matter of debate. 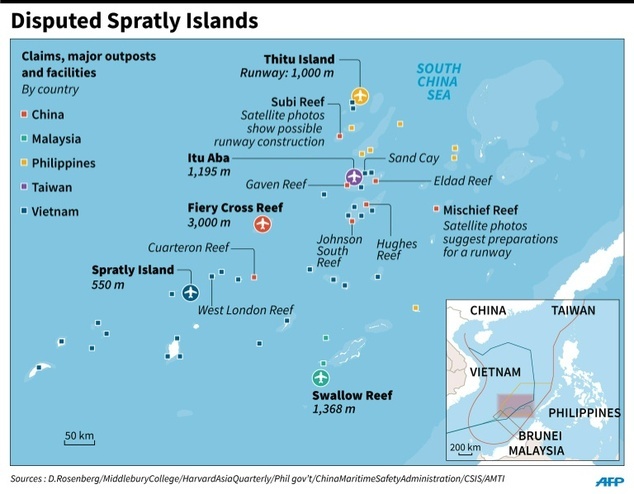 China’s maps group them together with the Spratlys proper while treating them as if they were landforms above water. As a result, the Chinese numbers of the Vietnamese-occupied features in the Spratly Islands range typically between 27 and 30. Vietnam argues that as the shoals lie deep under water and within 200 nautical miles (nm) from the Vietnamese baselines, they belong to Vietnam’s continental shelf and exclusive economic zone (EEZ) as stipulated in Article 76 of the UN Convention of the Law of the Sea (UNCLOS). According to UNCLOS, submarine features cannot be appropriated by occupation or otherwise. Eleven of the Vietnamese-held features in the Spratly Islands have natural portions showing more than 100 meters long above high tide. These are Southwest Cay, South Reef, Sand Cay, Namyit Island, Sin Cowe Island, Sin Cowe East Island, Lansdowne Reef, Spratly Island, Central Reef, Pearson Reef, and Amboyna Cay. Seven other features – Petley Reef, Discovery Great Reef, Collins Reef, West Reef, East Reef, Tennent Reef, and Barque Canada Reef – reportedly have portions that are naturally above water at high tide. These features may qualify as “islands” or “rocks” and may generate territorial waters in keeping with UNCLOS. Three features – Ladd Reef, Allison Reef, and Cornwallis South Reef – may be above water only at low tide. In the language of UNCLOS, they may be called “low-tide elevations,” which are not entitled to a territorial sea, EEZ, or continental shelf. Philippine media typically reports either nine or ten Philippine-held features in the Spratly Islands. The tenth feature is Irving Reef (Filipino: Balagtas), which lies between Loaita Bank and West York Island. There are no structures on this reef, but unverified sources report that Philippine Navy ships take turns to guard the feature. If this is true, the status of Irving is similar to that of several other features that are watched by Chinese and Vietnamese vessels but remain unoccupied. This roster disagrees with the more popular lists of the Philippine-occupied features on the location of Panata. Most of the Philippine sources render the English name of Panata as Lankiam Cay, a tiny sand dune located 8 nm east-northeast of Loaita Island. Most of the international literature also lists Lankiam Cay and Loaita Island as the two features occupied by the Philippines in Loaita Bank. But the APMSS map shows no outpost at Lankiam Cay. Instead, it locates the second Philippine outpost in Loaita Bank at an unidentified reef northwest of Loaita Island. Some Chinese and Vietnamese sources identify this Philippine-occupied feature as Loaita Nan. However, the coordinates commonly associated with Loaita Nan (100 42.5’ N, 1140 19.5’ E) refer to the reef that forms the western edge of Loaita Bank, where no structures are visible from satellite images available in Google Maps. At the same time, small structures are visible on Loaita Cay (100 44’ N, 1140 21’ E), which might be thought of as part of Loaita Nan but actually lies east across a seven-meter deep channel. Loaita Cay is 6.5 nm northwest of Loaita Island. Between 1970 and 1978, the Philippine moved in to occupy seven features in the Spratlys, with troops stationed on five islands. Flat Island, which lies about 6 nm north of Nanshan Island, appeared to be controlled by a garrison based at Nanshan until 2011, when some starshell-like structures were built on Flat to house a more permanent presence. A documentary produced by a local TV network in 2004 reported that only four soldiers were guarding both features from their shelters on Nanshan. A similar method appeared to be applied to the features in Loaita Bank, with Loaita Island serving as the base for the garrison until additional facility was erected on Loaita Cay. Some sources report that Lankiam Cay had a beach of more than five hectares in the past, but strong waves brought by a typhoon washed out the sandy surface of the island, leaving behind the calcarenite foundation that can be seen at low tide. The start date of the Philippine occupation of Commodore Reef remains uncertain. Philippine troops landed on the reef in August 1980 and removed a marker that Malaysia installed there a few months before, but it is unknown whether they stayed or left after the operation. One report states that they deserted it since 1986, but it is currently occupied by a military detachment. In 1999, the Philippines occupied Second Thomas Shoal by running the tank landing ship BRP Sierra Madre aground and using it as a shelter for a small garrison. Of note, the Pentagon does not count the Philippine station on Second Thomas Shoal as an outpost, although the contrary view is prevalent in the Philippines. This shoal is also the only low-tide elevation among the features occupied by the Philippines. All the other eight are visible above water at high tide. Itu Aba Island (Chinese: 太平島) is the only feature occupied by Taiwan in the Spratlys. It is also the largest natural land feature in the archipelago. Taiwan sometimes is said to hold two features there. This is likely to be inferred from reports of Taiwan erecting structures (in 1995 and 2004) and its officials landing (in 2003 and 2012) on Ban Than Reef. However, the best description of Ban Than’s current status is “unoccupied.” Ban Than has a beach less than 100 meters long, which lies about 2.5 nm from Itu Aba and about 4 nm from the Vietnamese-occupied Sand Cay. The Pentagon identifies no outpost on Ban Than, and no structures are visible in recent satellite images as well as photos of the reef. Sources with local knowledge told me that both Taiwanese and Vietnamese troops have occasionally planted materials on Ban Than and used them as targets for their live-fire exercises. Mischief Reef (美济礁 Meiji Jiao). When the Pentagon in May 2015 said there were eight Chinese outposts in the Spratly Islands, some thought that the eighth was Eldad Reef. But the APMSS map released three months later shows two outposts on Mischief alone, and none on Eldad. This is a fact that has often been missed. In addition, some accounts have mistakenly identified some features such as Eldad Reef, Whitsun Reef, Ladd Reef, and McKennan Reef as being occupied by China. For instance, two popular maps produced in 2015 by Reuters and AFP still reflected the incorrect information about Eldad Reef and Lankiam Cay. The mistaken status of Eldad, Whitsun, and Ladd Reefs is likely to have been inferred from reports about Vietnam protesting against Chinese troops landing on Eldad Reef in 1990, Da Ba Dau in March 1992 and Da Lac in July 1992. Da Ba Dau was identified as the Vietnamese name for Whitsun Reef, but Da Lac was mistakenly thought to be Ladd Reef (Da Lat in Vietnamese), which actually was occupied by Vietnam. In fact, Da Lac is the Vietnamese name for Gaven South Reef, a low-tide elevation 2 nm from Gaven Reef. 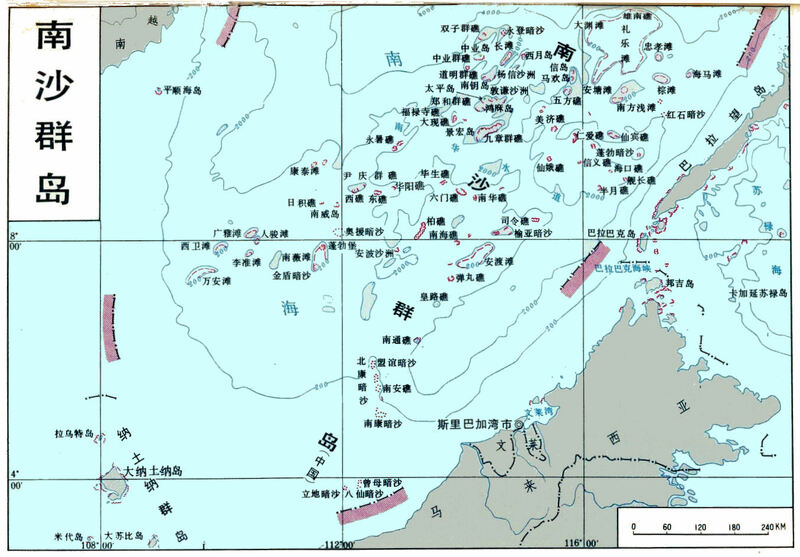 The APMSS map shows no Chinese outposts on any other reefs except the seven listed above. Some reports citing Philippine intelligence sources in June 2015 alleged that China had reclaimed land on Eldad Reef. However, separate sources with local knowledge later confirmed that Eldad as well as Whitsun, McKennan, and Gaven South Reefs remained unoccupied. Still, the unoccupied status of these features is fragile. Both Eldad Reef and Whitsun Reef have strategic value. They form the eastern edge of two major groups in the Spratlys – Tizard Bank and Union Bank. They have also gradually “become” islands. Sailing directions prior to the mid-1990s suggest that they were low-tide elevations. But today each reef bears a 100-meter long sand dune that has reportedly grown in area and height. A smaller sand dune has also emerged on McKennan Reef, which is often confused with Hughes Reef but actually lies 1 nm west. Several stories in the Vietnamese social media suggest that Eldad, Whitsun, and McKennan are frequently sites of quiet cat-and-mouse games between China and Vietnam, one attempting to get a foothold on these ‘new islands’ while the other tries to frustrate these efforts. Some scholars argue that Luconia Breakers was reclaimed into an artificial island by Malaysia sometime prior to 2009. But this argument makes little sense. As the coastal state with an EEZ over the shoal, Malaysia has a strong interest in keeping the feature submerged. A 2012 judgment by the International Court of Justice stated that “low-tide elevations cannot be appropriated.” Following from this, Luconia Breakers might be legally protected from China’s sovereignty claim if it remains a low-tide elevation. Some have questioned whether such a rapid elevation could indeed have occurred naturally in a short period of time. But this is hardly an uncommon occurrence. The emergence of small sand dunes has been registered during the last few decades at several reefs in the Spratly Islands, with Eldad, Whitsun, McKennan, and Ban Than being some prominent examples. With the help of waves and wind, coral sediment can either form growing sand dunes or be washed away – as might be the case with Lankiam Cay – without any movements of the reef foundation. Hydrographic evidence presented by the Philippines at the Permanent Court of Arbitration suggests that three of the seven Chinese-held features, including Fiery Cross, Cuarteron and Johnson South, have portions above water during high tide, but the other four, including Subi, Gaven, Hughes, and Mischief Reefs are low-tide elevations in their original nature before the massive land reclamation program since 2013 that turned all the seven into artificial islands. Investigator Shoal (Peninjau), since 1999. Several sources also list three more features, including Dallas Reef (Laya), Royal Charlotte Reef (Semarang Barat Besar), and Louisa Reef (Semarang Barat Kecil), as occupied by Malaysia. However, more recent, reliable, and knowledgeable sources from Malaysia, Brunei, and the United States confirm that there are in fact no troops stationed on these three features. 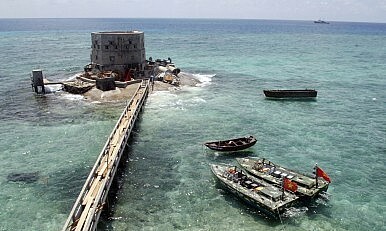 Malaysia appears to “occupy” Dallas Reef in a similar way to how the Philippines did with Flat Island. Troops from nearby Ardasier Reef, which lies about 3 nm from Dallas Reef, may watch and visit the latter on a regular basis. Royal Charlotte and Louisa Reefs, on the other hand, can hardly be classified as “occupied.” While there is a beacon on Royal Charlotte, visitors report that it was inactive and there were no others structures on the reef. Visitors have also found Louisa deserted with no other structures than an obelisk-shaped beacon, which was also not working. Among these eight features, Swallow, Mariveles, Erica, Royal Charlotte, and Louisa Reefs reportedly have some natural portions protruding above high tide, while Ardasier, Dallas, and Investigator are likely low-tide elevations. The beacons on Royal Charlotte and Louisa might have been built by Malaysia in the 1980s as a means to assert sovereignty over the two reefs. The only feature in the Spratly Islands that is claimed by Brunei is Louisa Reef. According to official statements by Malaysia and Brunei, an Exchange of Letters signed in 2009 has “established the final delimitation of territorial sea, continental shelf, and exclusive economic zone” between the two countries. The agreement unequivocally states that Brunei has sovereignty over two oil blocks within which Louisa Reef is located. Although Malaysia has not officially dropped its territorial claims over this feature, the agreement with Brunei substantially weakens Malaysia’s claims. As both Malaysia and Brunei have grounded their sovereignty claims over Louisa on the basis of coastal state rights, Malaysia’s acknowledgement of Brunei’s territorial sea, continental shelf, and EEZ is tantamount to effectively conceding Louisa Reef to Brunei. However, this appears to be a tacit understanding rather than an official agreement of any kind. The Exchange of Letters has yet to be publicized, and even if it would be made public, there would likely be no mentioning of Louisa. This is certainly the case with Limbang District, the other territorial dispute between Brunei and Malaysia. For all the attention that has been focused on the South China Sea disputes, there is still little clarity on some basic realities such as who owns what. As Bill Hayton has demonstrated, much of the literature relies on historical accounts that “use unreliable bases from which to write reliable histories.” It is hoped that this article is a step in the right direction towards lifting the thick veil that often conceals the truth about these disputes. Alexander L. Vuving is Professor at the Daniel K. Inouye Asia-Pacific Center for Security Studies. The views expressed in this article are his own and do not reflect those of the U.S. Government, the U.S. Department of Defense, and the Asia-Pacific Center. How Low Oil Prices Hamstring Vietnam in the South China Sea Disputes Crimea and South China Sea DiplomacyThe Philippines and the West Philippine SeaBrunei: Huawei’s Foothold in Southeast AsiaAre Indonesia and Malaysia Ready to Stand up for China’s Muslims?